Keaton achieved his accomplishments by working from a very young age as a pure auteur. Although others were credited with the cinematography, editing, and sometimes even co-direction of his films, it was Keaton who retained total control of all camera positions and editing decisions [4,5]. Even most of the scripts were extemporaneously made up under his guidance during the shootings of his films . And it was Keaton who was the sole originator of many of the most creative sight gags in his films. It was also well-known that Keaton did not use a stunt double for any of the dangerous stunts he performed in his films, and on several occasions he had serious accidents while performing these stunts that almost killed him . This is a ludicrously old-fashioned world reflecting in exaggerated terms the Keaton protagonist’s background. Thus this is an imaginary essentialist social world. Here the innocent protagonist must somehow deal with an evil cohort of adversaries, and this is where the classic silent-comedy slapstick pratfalls are performed. So the protagonist is now in a world full of nefarious, ill-intentioned villains, but it is still an essentialist world. In the final stages of many Keaton films, it seems that the entire universe has turned against the protagonist and has released its unfathomable fury. It is here that we enter into an expressionistic depiction of existential annihilation, and these are the scenes that always linger in the viewers’ memories. In Our Hospitality these three schemes of narrative presentation appear sequentially in the three distinct sections of the film. Note that this film uniquely has four members of the Keaton family in its cast. Besides Buster Keaton, himself, the film also features his wife, Natalie Talmadge, in the female lead; his father, Joe Keaton, as the railroad train engineer; and his one-year-old son, Buster Keaton Jr., as the protagonist when he was a baby. The story of Our Hospitality was inspired by the notoriously deadly Hatfield-McCoy family feud (1863-1891) in the US Appalachian region in the 19th century . That feud was fueled by an endless succession of back-and-forth revenge killings, and entered American folklore as an iconic element for mindless resentment and revenge. 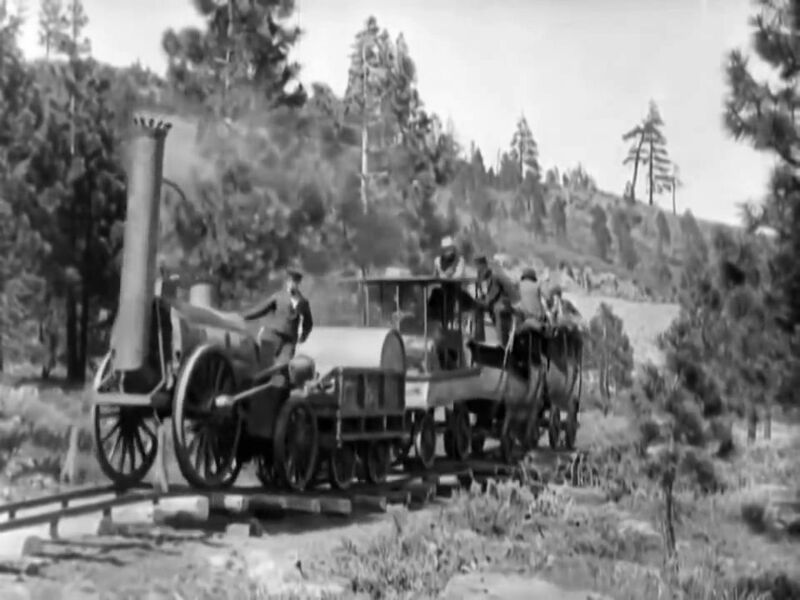 However, to satisfy his own fascination with American historical development, Keaton set this film mostly in 1830, when the American train system was just getting started. This was a technologically primitive time when even the pedal-driven bicycle was not yet in use, and Keaton accurately shows himself using a human-leg-propelled “dandy horse” to wheel himself around in an early scene . The film opens in The Quaint narrative tone by setting the scene for subsequent comedic mayhem. The film opens in 1810, during the deadly McKay-Canfield family feud, when the last adult male Mckay family member is killed. One-year-old Willie McKay’s mother takes her boy to New York City in order to escape the horrors of the family feud. 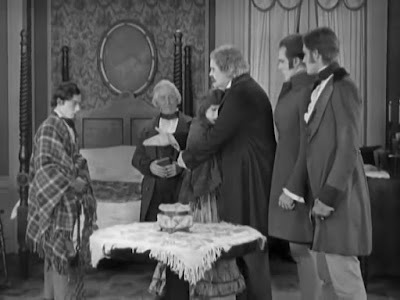 In 1830, however, 21-year-old Willie McKay (played by Buster Keaton) receives a letter informing him that he should go to Appalachia to claim his inheritance as the sole heir of the McKay family estate. So the young man decides to take the train there, and much of this section of the film depicts the quaint primitiveness of early 19th-century American life, even seen from a 1923 perspective. McKay shares a seat in his train coach with an equally shy young woman, Virginia Canfield (Natalie Talmadge, Buster Keaton’s wife), who, unbeknownst to McKay, is a member of the feud-linked Canfield family. It is interesting when I look at Natalie Talmadge today, by the way, to see a kind of classic feminine beauty that was apparently a feature of the 1920s but which seems, regrettably, to have disappeared from our current imagery of glamor. Anyway, much of this section of the films depicts the ludicrous frailty of the early train system, where, for example, train personnel found that when they encountered a stubborn mule on the train tracks, they found it easier to move the tracks to the side than to move the mule. After a series of such comedic mishaps, the ramshackle train makes it to its destined southern town, and its passengers alight. In the town, the film’s narrative moves into slapstick mode. 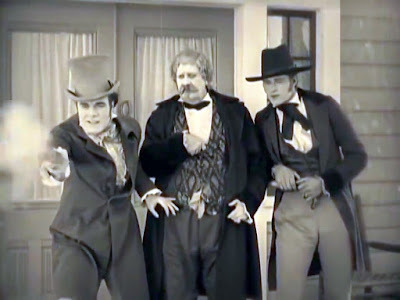 Joseph Canfield (Joe Roberts) and his two adult sons discover that the still unsuspecting Willie McKay is in town and make immediate feud-fuelled attempts to shoot the young man. But various slapstick moments of accidental circumstance save him on each occasion. Keaton is again faithful to the historical context in these scenes by showing the limitations of the gun technology of those days, when revolvers were not yet in use and single-shot guns were the norm. Virginia Canfield, though, is still unaware of McKay’s family identity, and she invites the young man to her family home for dinner. When he arrives, he is greeted graciously, but the Canfield sons make immediate preparations to shoot him. However, the Canfield father quickly privately admonishes his sons that the rules of “Southern Hospitality”  prohibit them from killing any guest on their home premises. McKay finally gets wind of his precarious situation, too. He now realizes that as long as he can stay inside the house, he is safe; but if he steps a foot outside the door, he is likely to be shot. There follows a cat-and-mouse game of characteristically Keaton-crafted slapstick encounters involving attempts to get McKay to leave the home so that they can kill him. During this time, too, McKay and Virginia are gradually falling in love. Eventually McKay manages to escape the Canfield home by dressing up as an old lady. The Canfields quickly discover the ruse, and the mad chase begins. The film now enters its surreal, existentially threatening phase, when Keaton seems not only to be fleeing human adversaries but is also threatened with existential annihilation by Mother Nature, herself. And this is where the film achieves its memorability. Some of the ensuing scenes must have entailed incredible engineering ingenuity in order to play out so miraculously. McKay, hotly pursued by the Canfields, runs madly into town and jumps onto a train and then onto a horse, which carries him madly into a wilderness. He steals another train engine and gets into its tender car. 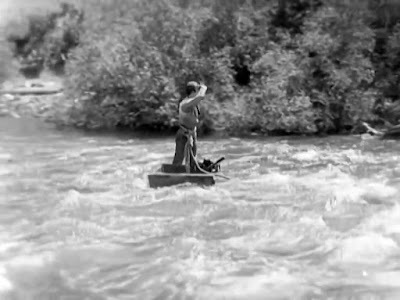 When the careening train derails on a mountainous track, the tender car somehow crashes off the tracks and down into a roaring river, with the tender box becoming a boat that McKay manages to try and steer in the raging waters. Virginia, worried about her new love, has also been looking for him. When she sees him in the river, she gets into a boat to try and save him. But things get only more precarious, and the raging torrents leave McKay and Virginia both frantically swimming in the water and heading for a catastrophic waterfall. 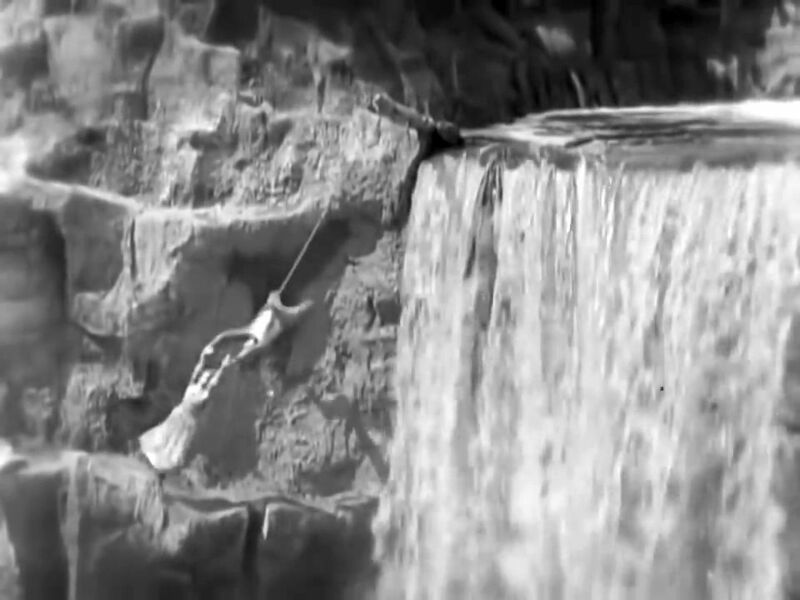 McKay’s breathtaking rescue of Virginia at the waterfall’s edge is the film’s highpoint and one of the most memorable scenes in silent movie history. In the end, McKay and Virginia make it back to town and are immediately married by the kindly village parson. The Canfield men discover the fact of the couple's union too late, and their own rigid adherence to their traditional mores and protocols forces them in the end to welcome Willie McKay as a new member of their family. On the production side of things, we can only marvel at how Keaton managed in the filming of Our Hospitality the mechanics of all those carefully choreographed slapstick and maelstrom scenes. In particular, those closing maelstrom scenes can be said to represent Keaton’s opening steps into the cinematic pantheon. In fact those scenes are so breathtaking that we might likely overlook some earlier jump cuts or some other actually very nice touches, such as Keaton’s evident fascination with and fondness for dogs. Looking at Our Hospitality from today’s increasingly hostile and perilous world perspective, we can appreciate Keaton’s dismissive take on the inanity of revenge and resentment, as well as the vacuity of rigid adherence to social protocols that are not supported by an innate sense of compassion. In today’s utilitarian-focused world of individual attainment, it seems that we are forgetting about a fundamental aspect of human existence – our intuitive compassion for everyone we encounter, including our so-called (and often arbitrarily so) enemies . This feeling of human compassion, not selfish resentment, needs to underlie what social protocols we may claim to adhere to. In his high-spirited way, Keaton was reminding us more than ninety years ago that open-hearted compassion and resourceful, never-say-die optimism are the ways to go. Jim Emerson, “Buster Keaton’s ‘Our Hospitality’ (1923) at Film Forum (Aug 01)”, Alt Screen, (1 August 2011). The Film Sufi, “Phenomenology and Red Desert”, The Film Sufi, (11 September 2010). Diane Christian and Bruce Jackson (eds. ), “Buster Keaton ‘Our Hospitality’, 1923”, Goldenrod Handouts, Buffalo Film Seminars, (XXI:1), The Center for Studies in American Culture, State University of New York, Buffalo, NY (31 August 2010). “Hatfield–McCoy feud”, Wikipedia, (18 May 2018). “Dandy horse”, Wikipedia, (26 April 2018). “Southern hospitality”, Wikipedia, (28 April 2018). Pankaj Mishra, “A Gandhian Stand Against the Culture of Cruelty”, The New York Review of Books, (22 May 2018).